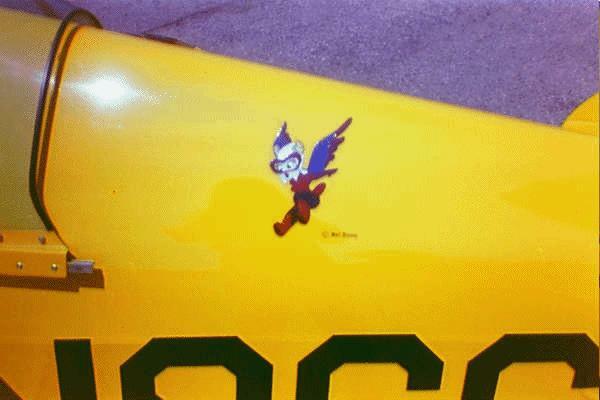 Fifinella was designed by Walt Disney studios as the logo for the Women's Airforce Service Pilots (WASP), the American women military aviators of World War II. You can see her here painted on the side of her namesake, the Pitts S1-C, "Fifinella", in honor of these courageous and capable women. The WASP encountered considerable opposition within both the military and the civilian government. Despite the exploits of famous women pilots like Amelia Earhart and Jacqueline Cochran (the founder of the WASP), the belief prevailed that women were fragile, physically and emotionally, and incapable of flying competently, much less piloting the high-performance military aircraft that they were intended to ferry. Flying was for men; women belonged at home in the kitchen. These remarkable women proved their detractors wrong. During their countless ferry missions, the WASP flew the hottest fighters and the heaviest bombers of the US Army Air Corps, through difficult weather, from coast to coast and across the Atlantic. Their safety record on these missions far exceeded that of their male counterparts. Throughout the country in the latter part of the war, pilots, instructors, tower controllers, and ground crews were frequently stunned to see these women, many of them petite and all of them slender and attractive, climb down from the cockpit of the massive B-17 Flying Fortress bomber or the state-of-the-art P-15 Mustang fighter that had just executed a flawless landing at their airfield.